2013 is the year for luxurious and spa-inspired bathroom designs and what better way to enjoy a spa-inspired bathroom than with whirlpool and airpool baths. If you want to turn your bathroom into a day spa right in your own home, then these baths are the top choice for you. When choosing whirlpool and airpool baths, it’s important you understand the difference between the two. While one isn’t better than the other and its’ personal choice that will make your decision for you, it’s good to know that whirlpool baths jet water while airpool baths jet air. That being said one consideration that you need to know is you can never run a whirlpool bath empty as you will damage the motor while an airpool bath can be run without any water in the bath. There is a long list of health benefits when it comes to whirlpool and airpool baths. They save you time and energy because you don’t have to head to the day spa to be pampered, you can come home run the bath and enjoy all the health benefits associated with these amazing and luxurious baths. The main health benefits that you get to enjoy when using whirlpool and airpool baths include muscle and joint pain relief. The warm water combined with the jets massage aching muscles and joints making them an ideal choice of athletes, those suffering with arthritis and they are superb for stress relief. We live a stressful life, these days we are all trying to juggle family and work commitments and many of us suffer severe headaches caused by stress. Lying for some time in whirlpool and airpool baths will help relax us, reducing tension headaches and leaving us rejuvenated. Other health benefits that are due to using these baths include improved circulation, improved immune system, a better digestive system and lowered blood pressure and cholesterol, just to name a few. So if you’re looking for luxury in your bathroom, you want the advantage of your own private day spa with all the health benefits you can imagine, then you need to consider installing whirlpool or airpool baths. One of the great advantages of the whirlpool and airpool baths is that they are easy to clean and with an annual maintenance carried out, they can last a long time without any problems. If you’re after a “wow” factor when designing your bathroom and you have the space, then you need freestanding baths. These baths are designed to take your breath away every time you step into the bathroom. Available in a selection of shapes to suit any bathroom design, freestanding baths are guaranteed to make a statement. The first decision you will need to make about freestanding baths is where to place them. Many people find placing the bath in the centre of the room makes a huge statement, but freestanding baths look fantastic against a wall or even under a large picture window. Because the baths come in a choice of shapes, you can blend your freestanding baths in with the rest of your bathroom décor beautifully. The freestanding baths come in a selection of shapes to blend in with any bathroom design. My personal favourites are the Assai freestanding baths which are rectangular in shape being wider at the top than bottom and the Rubarto freestanding baths which are an elegant oval shape. The reason I love these freestanding baths is that they are also available in a selection of colour options, enabling you to really make a statement in your bathroom area. Most of the freestanding baths are rectangular in shape with angled sides making them unique and stylish and giving you the ability to blend them into your bathroom area with ease. With so many bath designs available you may be wondering why freestanding baths. Actually it’s down to preference, but the freestanding baths are as their name suggests, they stand on their own even when placed against a wall, some of them are availdable in a number of colour options and the best thing is that they are deep baths, enabling you to really soak your worries away after a long day at work. Once you have carefully planned your bathroom and have chosen exactly where to place your freestanding bath you can start planning the remainder of the space. The most important consideration is not to compromise your floor space and if you are placing freestanding baths in the centre of the room, be sure there is enough space around the bath for you to more freely. Airpool baths are a top choice this year as homes across the country renovate their bathrooms to a spa-inspired and luxurious theme. These baths are not only available in a choice of shapes and sizes, but they offer a host of health benefits and even better, they are easy to clean and maintain. If you are looking for the convenience of a spa in your home, then adding the luxury of an airpool bath in your bathroom is the first step to achieving this. 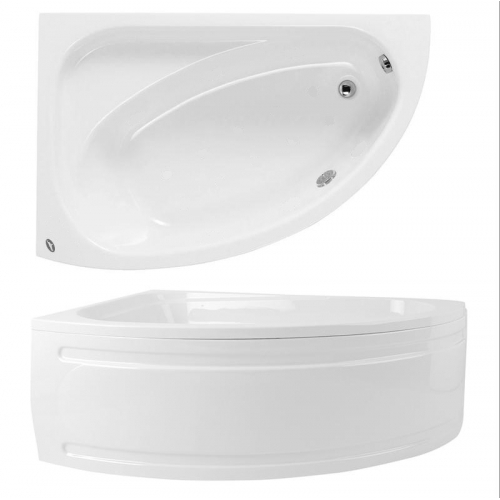 The advantage to the airpool baths is that they are available in such a large variety of shapes and sizes to suit any size bathroom. From the stunning semi-circular design to the rectangular choices and the large oval options to the more square choices. You can blend these luxurious baths into any bathroom design. When choosing airpool baths remember to keep your style the same throughout the space. If you have chosen straight edged designs for your basin, shower and vanity, then ensure you choose from the rectangular or square airpool baths. The same applies if you have chosen cylindrical or curved fixtures and fittings, choose from the oval or semi-circular airpool baths, allowing your design to flow freely throughout the space. What many people don’t realise is that airpool baths offer a host of health benefits and are the ideal choice if you are looking for that luxurious touch in your bathroom. These baths are a welcome addition to those with arthritis or circulation problems. The air jets gently massage aching joints and muscles while you bath and the massaging action dramatically improves circulation. These baths are a wonderful addition if you are looking for that long and relaxing soak in the bath after a long day at work and can help alleviate stress. Airpool baths are very easy to clean and maintain. It’s important to have your bath serviced by a professional at least once a year to ensure the motor is working to its best. But the rest of the time you just need to take a little time to clean the bath. After each use let the jets run while the bath is empty and use a cloth to wipe out any excess water. Unlike the whirlpool options, airpool baths can run empty, reducing the risk of damaging the motor in the long run. We are all trying to achieve the spa-inspired and luxurious bathroom design. 2013 is a year of luxurious bathrooms and placing a beautiful bath in the bathroom is just one of the many ways to achieve this. Of course these days’ baths come in a selection of shapes and sizes from your corner bath designs to your rectangular bath designs. Deciding which bath is the right choice may seem a little daunting, but you need to choose the bath that best suits your overall design. When it comes to the smaller bathroom you are more restricted on space which means you’re more restricted on the baths you can choose. Corner baths and shower baths are great additions to the more compact bathroom design. Corner baths are available in a choice of styles from the oval design to the more rectangular bath design. Shower baths are available in a compact design and come with a shower screen, enabling you to enjoy the best of both. If you are lucky enough to have a spacious bathroom, then you are one of the few. The advantage to this is that you have a blank canvas and are able to design your bathroom as you have always dreamed. Roll top baths, freestanding baths and rectangular baths work beautifully in the spacious bathroom. If you want to place your bath against the wall, maybe under a large window or against a feature wall, then the freestanding and rectangular baths are what you are looking for. Rectangular baths have a stunning straight edges, perfect for the modern bathroom design. While they have straight edges the inside of the bath varies dramatically. There are options where the rectangular design is carried through on the inside and then there are those that are almost kidney shaped on the inside, while the outside remains a straight edged rectangular design. Another option, of course, is to install a spectacular freestanding or roll top bath in the centre of your bathroom, making it a centrepiece and a feature, giving your bathroom that “wow” factor you are hoping to achieve. You can add a luxurious touch to any bath by adding whirlpool or airpool options. Adding these fantastic spa jets to rectangular baths really change your bathroom space inch your own private spa. Just imagine, you will never need to visit the day spa again and you will have the luxury in your own home. 2013 is a year for spa-inspired and luxurious bathroom designs. It is becoming more important to have that luxurious bathroom in your home than ever before, a chance to come home and relax in a large roll top bath rather than heading to the spa or gym. We spend our lives juggling work and family life, these days lifestyles are chaotic and we work hard to enjoy the finer things in life, such as a luxurious en-suite or family bathroom in our home so why not add that touch of luxury with spectacular roll top baths as the centre piece. When choosing roll top baths you probably want your bath to become a centre piece in your bathroom and you have a few choices available to make that dream a reality. There are a number of choices available but before you start looking it’s best you choose exactly where you intend placing your new bath. Is it going in the corner of the bathroom with two sides against a wall or is it going against a back wall with three sides open? The roll top baths are available as single or double ended which means you can place them wherever you like in the bathroom and still enjoy the benefit of a large, deep and comfortable bath, perfect for enjoying a spa-like experience each day when you get home from work. Then you have the choice of roll top baths or slipper baths, now the slipper baths are raised at one or both ends, giving you that ideal space to lie back. 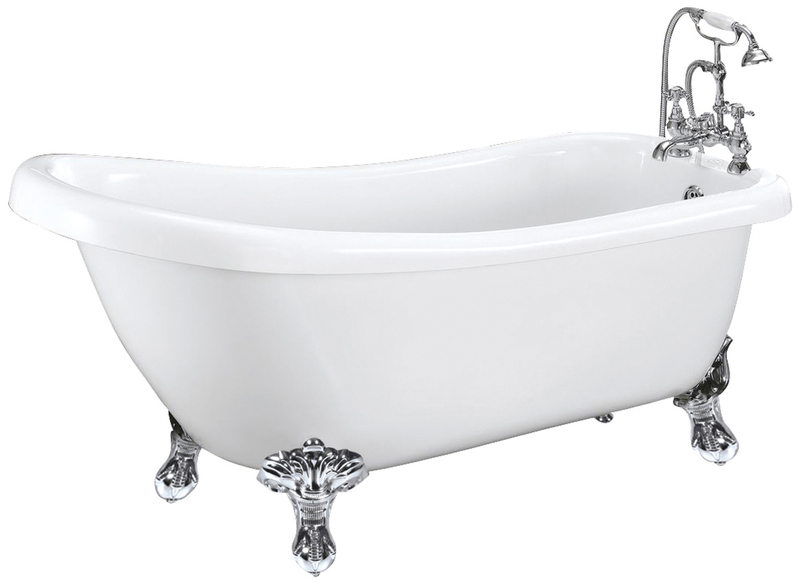 In fact these baths give a fantastic statement to any bathroom even though you would expect them in Victorian times with their sturdy feet which adds to the elegance and style of the design. Whenever you choose a piece of bathroom furniture such as roll top baths to add that stylish finish to your bathroom you need to ensure that you are not limiting the floor space you have available. Larger bathrooms benefit from these baths being put on display as such, in the centre of the room giving the bathroom that “wow” factor. Obviously in a medium sized bathroom, placing roll top baths in the centre of the room would not be a practical option, here you can place them against a wall or even in the corner so that you can still enjoy the luxury and style these baths offer to your overall bathroom design. Spa inspired and luxury bathrooms are the top of the list when it comes to bathroom designs this year. Bathrooms, which used to be an essential space in any home are taking on a different role, they are a space to unwind after a long day, a place which oozes luxury, sophistication and elegance and the more luxurious the bathroom, the higher your home value. Most people don’t renovate their bathrooms just to increase the home value, but it is a welcome extra when you have completed your luxurious bathroom and know it’s added a few pounds to your home value. One of the most popular additions to a luxury designed bathroom is whirlpool and airpool baths. People spend thousands at day spas each year, getting hydrotherapy treatments for aching muscles, poor circulation and arthritis. Why spend so much money when you can have the convenience at home in your own bathroom? You may be wondering what the difference is between whirlpool and airpool baths, when it comes to health benefits there is no difference. The difference is in the way that they work, whirlpool baths jet out water, while airpool baths jet out air. It’s that simple. The only slight difference is you can never run a whirlpool bath without water covering the jets, this is very important as you can burn out the motor. Whirlpool and airpool baths come with a host of benefits. They offer great massaging powers to those with aching muscles, relaxing in a hot bath while the jets gently massage aching joints is exceptionally beneficial. 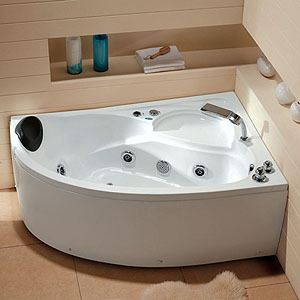 These baths also improve circulation and help aching joints for those suffering with arthritis. Away from the healing benefits, the whirlpool and airpool baths are easy to clean and maintain, which means that the choice is yours on which one to pick, one is not better than the other. The whirlpool baths require you fill the bath with soapy water using a cleaning mixture which you run through the system, you then add clean water and rinse the system before drying it out with a towel. The airpool baths use the air jets to keep the system clean, once the bath is empty, you can run the jets for a minute and then wipe out the bath, ready for the next use. The biggest advantage of these luxurious baths is the statement they make in any bathroom design. They add that sophisticated and luxurious finish to any bathroom design. This year is a year of luxury bathrooms and there isn’t a better statement in a bathroom than a stunning freestanding bath. When it comes to luxury you want comfort, you want beauty and a space where you can relax. Spa inspired bathrooms are also a popular choice this year, they also ooze that luxurious feel and a bathroom that is designed for comfort can add value to your home when it comes time to sell. A bathroom that is minimalistic in design finished in white with plenty of glass makes a great statement, but you want to add that splash of luxury. Some of the best bathroom designs I have seen this season incorporate the three, minimalism, glass and luxury. Freestanding baths come in a range of sizes and designs, so you can easily find the best one to suite your bathroom design from the stunning oval designs available in a range of colours to the rectangular designs. Picture a white bathroom with white walls and floor, a large purple freestanding bath in the centre of the room with a large walk in shower to one side with glass enclosure to capture the light. With the bathroom all being white and simple, the freestanding baths colour is the splash of colour the bathroom needs, it showcases the luxurious side of the bathroom, add a whirlpool or airpool option to the bath and you have luxury second to none. Another of the fantastic luxurious designs I have seen is a bathroom in a home set in the heart of the country, the bathroom had a large picture window and a rectangular freestanding bath was positioned next to the window in white. The floors, walls and ceilings were white with light brown vanity units and glass basins, it made such a statement incorporating the light and bright design with the sheer luxury of the bath nestled under the window where you can soak in a steaming bubble bath as you gaze across the country landscape. It doesn’t get better than that. Freestanding baths can be placed in the centre of the room, under or next to a window or against a wall, the choice is up to you. They are available in white to stick to the minimalist design or some of them are available with a selection of coloured panels for you to choose from. Either way freestanding baths make a luxury statement in a bathroom design when you’re trying to achieve luxury and practicality into one space. Spa inspired bathrooms offer a relaxing space to unwind, a delightful room which offers comfort and practicality and that makes a statement in the home. These bathrooms are designed to make you feel as though you have just visited a day spa every time you step out of them. This style of bathroom is increasing in popularity and you are finding more spa inspired bathrooms throughout the country than ever before. What makes these bathrooms so special? It’s the ability to relax, enjoy your bathroom space and take pleasure in the fact that you have a bathroom in your home which has the “wow” factor. Don’t be fooled you do not need a huge bathroom to pull off the spa inspired design. Space for a toilet, basin, vanity and bath or shower is all you need. Remember these days you can get shower jets if you don’t have space for the luxurious airpool baths. It’s how you lay out the space that’s important, spa’s are minimalistic, they maximise the use of the floor space, so planning is an important step in designing your ideal spa inspired bathroom. When you walk into a day spa the one thing you feel is immediately calm, the space is relaxing, there isn’t mountains of clutter everywhere and the natural tones help relax you. In your own bathroom you want to reduce the amount of clutter you have in the bathroom and floating, better known as wall hung, vanity units do the job perfectly. These units hang on the wall and include a basin, so you aren’t taking up too much space and they also offer more than enough storage space to keep your new bathroom neat and tidy. The bath you choose for your spa inspired bathroom is very important. Airpool baths work beautifully for this specific design. The air jets pump while you lie back in the bath, massaging your muscles and helping with all aching joints. In fact airpool baths come with a range of health benefits. They are ideally suited for those with aching muscles, sore joints and poor circulation. An even bigger advantage is that they are so easy to maintain and clean and don’t need to cost you a fortune. The airpool baths in the spa inspired bathroom design are a welcome choice, offering you that added luxury to what is already guaranteed to be a spectacular design. The benefit of corner baths is how much floor space you can save, the ability to neatly tuck your bath in the corner leaves you plenty of room in any bathroom to put other bathroom products without the bathroom looking too cluttered. For many of us we think of a corner bath and immediately we imagine a bath with a rounded front and triangular back that fits neatly in the corner. Yes these designs are available and they are stylish and elegant and always offer that modern twist in any bathroom design. What you may not realise is that there are many other options. A corner bath doesn’t need to be triangular in design, in fact you can have a rectangular bath for along the wall that is specifically designed to fit in the corner at one side. When choosing corner baths for your bathroom it’s important that you measure the space you have available to ensure the bath will fit with ease. The benefit of corners baths is that they don’t compromise your floor space, so you need to take this on board and ensure that you don’t reduce your floor space too much by installing one of these fantastic bath options. Space is a huge factor when choosing to add any bath to your bathroom design, luckily corner baths enable you to enjoy the luxury of a bath in a smaller bathroom design. By saving floor space you are able to still include a toilet, basin and even a vanity and still have space to move around with ease. When it comes to design options, as I mentioned before you will not struggle with choices available. The Monaco corner baths are the traditional styled corner bath with the perfect corner fit and rounded front, they will blend in with any bathroom design. Then there is the Saranto corner baths, these are my favourites. They are unusual in shape with very straight sides, ideal for the modern bathroom where you want to get away from the rectangular or square design, but don’t want the rounded shape. Space corner baths have the ideal corner positioning with a narrow and wider side to the bath along with a straight edge. These are the perfect choice for any bathroom whether you have a modern or traditional bathroom. Lastly the Legato corner baths are modern and stylish with a unique hexagon style shape to work with any bathroom design. I really think at some stage we all want a little bit of luxury in our bathroom. If you are anything like me after a day of juggling work, home and the family all you want to do is soak in a hot bubble bath. When you get into the bath and start soaking, are your surrounded by peaceful tranquillity and luxury? What I did is turn my bathroom into my own haven, a place to unwind with delightful scented candles and relaxing bath salts. On an average day I will get up before the birds, I’m sure you’ve been there, I get everything ready for the day before waking up the family. It is then a whirlwind as everyone rushes around the house to get ready and then we all run out the door in different directions. After work I pick up the children and get them to their after school piano lessons, football games and dance classes before dashing home to start getting tea ready. Believe me by the time everyone goes to bed I just want to climb into my roll top bath and soak the day away. You don’t have to spend a fortune to have a haven in your bathroom, all you need is roll top baths, wonderfully scented candles and some relaxing bubble bath or bubble salts. I lock the bathroom door and escape for about an hour each night, I think I deserve this little time to myself each night, it’s something I do for me. 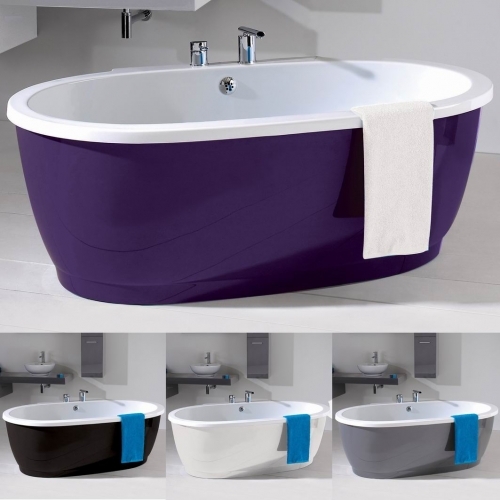 The reason I chose roll top baths is because you can sink into them, they are so deep, so you’re not left with your knees sticking out or not being able to cover yourself with water when you lie back, which happens with so many of the traditional baths. Another reason is the way they look. Roll top baths are elegant, sophisticated and stylish and the minute you place one in your bathroom it becomes the bathroom centre-piece. You can place yours flat against the wall under a window, that always looks so appealing to the eye or you can place it with one side against the wall, the roll top baths are available in a range of designs enabling you to find one that works with your overall bathroom design, so you can put your own little piece of paradise together in your bathroom.